The new web site is not only improved in contents and organization of information, the graphical presentation has also been completely re-designed. The site was beta-tested by many City Planning employees, Commissioners, and members of the public. Try it out to download forms, read up on local zoning, review upcoming agendas, investigate demographic statistics, and much more. Gang violence is one of the most intractable problems facing Los Angeles. It touches every community, devastating families and dampening the future for too many of our children. Effective police work is critical to helping communities stop gang violence, but we cannot arrest our way out of our gang problem. We need to give at-risk youth opportunities to develop their talents and their skills, to keep them off the street and away from gangs. "At the Park After Dark" is an innovative program launched by my office, in partnership with the Department of Recreation and Parks, the Aztecs Rising Firefighter crew, and Artstorm Los Angeles to do exactly that. Based at the Glassell Park Recreation Center, At the Park After Dark keeps the center open into the late hours of the night, Wednesday through Saturday, providing programming and activities for youth age 12-18 throughout the summer. The inspiring stories of the Aztecs Rising crew, former gang members now fighting fires throughout the state, is on full display as their members host boxing lessons. A mobile skate park is brought in to complement our basketball and soccer leagues. Local DJs host turntable classes, and Artstorm Los Angeles allows would-be taggers to paint using aerosol cans on free canvas, turning a destructive activity into a creative one. 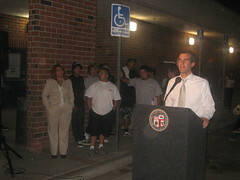 At the Park After Dark is a small step in the much larger battle against gangs in Los Angeles. It’s going to take a coordinated effort on behalf of government, the private sector, and community groups to eliminate the root causes of gang violence - and At the Park After Dark shows how it can be done. Building off the success of the Garcetti-Greuel Tax Reform Package that has returned $92 million in gross receipts tax to small businesses, I once again joined my colleague Wendy Greuel in introducing a measure that would expand the business tax incentive to all businesses in the newly minted state enterprise zones. These zones are designated by the state based on poverty statistics and provide state tax breaks that seed growth and job creation in some of our poorest communities. By coupling local incentives with the state tax break, we can build sustainable businesses that will provide high-quality jobs for generations. Three years ago, voters passed Proposition O with 76% of the vote, one of the highest approval rating for any bond in the city's history. The half-billion dollar water quality initiative gave us the means to clean our watershed, and we are already realizing the benefits. I joined Councilmember Reyes, the President of the Board of Public Works Cynthia Ruiz, and Larry Smith from Northeast Trees at the opening of Oros Green Street, the first stormwater infiltration street in the city. Strategically positioned to capture runoff from the surrounding hills of Elysian Park, Oros Street has long seen water flow over it and into the LA River, polluting our watershed and eventually endangering the lives of children and adults alike swimming in the ocean or playing at the beach. With funding from Prop O and state and federal sources, Northeast Trees put together a project that shows how our infrastructure can purify, rather than contaminate, our water-- and how we can do it green. Using gravel and natural filtration techniques, Oros Street will now take the same water it once merely conveyed to the river and now clean it, while providing green space that beautifies the community along the river. Oros marks the first complete Prop O project, and also marks the success of the city in meeting its federal water quality standards. We are the only city in the nation in compliance with our Total Maximum Daily Load compliance timeline, thanks to the installation of hundreds of catch basins throughout the city and projects like Oros. As we continue to take our water destiny into our own hands, Oros provides a model of how we can make our water pure using green infrastructure. When we launched UNTAG (Uniting Neighborhoods to Abolish Graffiti) in 2004, my office set the ambitious goal of slashing graffiti in half in Council District 13 in two years. 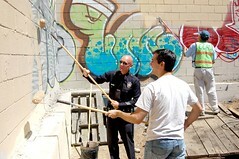 Last year, we met and passed that goal, with a reported 55% drop in graffiti in the area. Using an ever-expanding network of block captains, rapid-fire paint out crews, and a strong partnership with the police department, the communities of CD13 claimed a victory against visual blight and improved the quality of life in their neighborhood and beyond. One year later, my staff and I once again drove the district and counted every tag in CD13. At the end of the day we reported a whopping 68% drop in graffiti from 2004, from a high of 20,763 tags in the first year to a new record of 6,677 tags this year. We've intensified our efforts, quickening the pace of paint outs, growing our army of block captains, and working with the police to respond to incidents of graffiti in high-tagging areas. This year' s success was topped off when the Dodgers Dream Foundation donated $15,000 to the Central City Action Committee (CCAC), one of our paint out crews, allowing CCAC to buy a new equipment truck. CCAC employs youth to paint out graffiti, pick up trash, and beautify the community from which they come. Less than a year into my first term, I met with more than 1000 community members from LA Voice at the Blessed Sacrament church in Hollywood who said with one voice: we need affordable housing. That night, I committed to building 500 new units of affordable housing in Hollywood. We knew those units were an important first step, but not nearly enough to ease the housing crisis. Five years later, I once again joined more than 1000 residents at Blessed Sacrament who again said with one voice: we need affordable housing. Without affordable housing in our urban core, our traffic will get worse, our air will get dirtier, and our time with our families will become scarcer. We will continue to work to ensure that tenants know their rights and to find a permanent solution to the housing crisis in Los Angeles. See a TV news report on the meeting. Also, Ryan Bell blogged the meeting too. 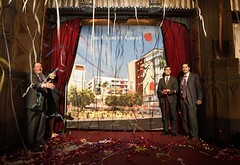 The curtain has risen on Hollywood’s single most ambitious privately funded, large-scale redevelopment project to date. In today’s Hollywood, you can see the stars, frequenting nightclubs and restaurants, even buying lofts the new adaptive reuse projects. You can see the industry that supports them, too: Hollywood the business has returned to Hollywood the neighborhood, with production, post production and live entertainment in full force. And you can see the future of Los Angeles, the blueprint for 21st –century urban development. BLVD6200 is an organic part of that blueprint. We’re locating our housing next to our jobs. There’s been discussion recently about why Angelenos who live near transit are still taking their cars to work. I’d like to add two perspectives to those discussions. One, that we’re still approaching the critical mass that will get people out of their cars. Second, that replacing car commutes isn’t the only metric in the fight against congestion and pollution. Many of the residents of BLVD6200, for example, will be able to walk to work. What’s more, they’ll walk to the shops downstairs, eliminating daily car trips as they do. How many car trips do you take besides your commute? How many could be eliminated if you lived in a neighborhood with bars, restaurants, and theaters, or in a building with a dry cleaners, a video store, and a market? This project may be called home by many of the people who work here in Hollywood. And it will feature 100 units affordable to low- and moderate-income Angelenos. It will also help us write the blueprint for a city that moves. The developer will contribute two million dollars to the Hollywood Mobility Trust Fund. For the people who move in, the welcome wagon will include a ticket to ride: new tenants will receive MTA passes to get them using the Red Line above which they live. Parking spaces will be set aside for car share and alternative fuel vehicles. And employees here will be encouraged to get out of the cars. BLVD6200 won immediate and vocal support from the neighborhood councils who represent Hollywood--not people who take traffic impacts lightly. They looked at it and they said that this is how they want their city to grow. I also want to acknowledge the Nederlander family, on whose property surrounding the Pantages theater this project will sit. They're best known for putting on a great show. When the lights come down and the season ends, they have always remained a true partner in building Hollywood. Followers of the blog will know that my staff and I aspire to the highest standards of constituent service, legislative accomplishment, and boat racing. I'm pleased to announce that Team CD13 swept the elected officials category at the Lotus Festival, and was outraced by only one boat in the entire weekend's race. Congratulations to assistant coach Sam Siegel, cockswain Alejandra Marroquin, navigator Helen Leung, and rowers Mitch O'Farrell, Bea Hsu, Amanda Medress and her brother Zach Medress, who pinch-rowed when we found out on the race morning that a mysterious back injury had claimed one of our rowers. 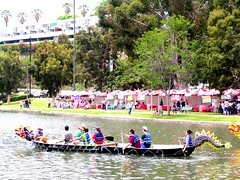 Dgarzila and Sha in L.A. also report on the boat races. Congratulations also to Mayor Villaraigosa, whose staff had their first-ever boat on the water and demonstrated considerable enthusiasm. And thanks too to Heather Repenning and Kabira Stokes, who worked with Y Que to produce a multi-hued team uniform that represented each of the neighborhoods that CD13 comprises. 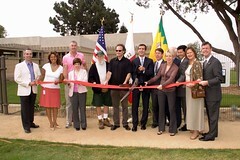 Just a few months after Hollyhock House was named a National Historic Landmark, I joined officials from the Department of Water and Power, Recreation and Parks, and the Metropolitan Water District to dedicate the Great Lawn at Barnsdall Park. Done in the style originally envisioned by architect Frank Lloyd Wright, the lawn employs 6 drought-resistant trees, 18 different species of shrubs, and hybrid Bermuda sod while modeling the new smart-irrigation system to show how we can use water in sustainble fashion in an arid environment during a drought period. You can visit Barnsdall to see Shakespeare in the Park, exhibits at the Municipal Art Gallery, and tours of the landmark house. 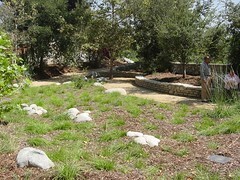 Now you can visit to see how a lush, green lawn can be a sustainable part of landscaping in Los Angeles. Each year, the Los Angeles City Council takes action on almost 10,000 agenda item. For two days, my colleagues and I gathered at a hotel near the Port of Los Angeles and focused on only one: "Dialogue and discussion concerning issues attendant to Council's information sharing, partnership in city government, policy direction and operational improvements." We too often in government replace the important with the urgent. We don't dedicate time to take stock of the issues that matter to Angelenos the most, or to find the long-range vision and policy tools needed to address them. The retreat was our way of changing that. In a 36-hour span, we heard about each council district, the opportunities that every neighborhood presents and the common challenges that each community faces, whether gang violence or poor air quality. We discussed how the power of the council as a whole can be used to articulate policies and programs that will address these issues on a citywide basis. 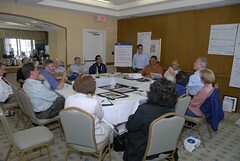 We thought through strategies to make the council more effective and more accessible to residents. From being more proactive in setting budget priorities to solutions to gang violence, this council's record in getting things done was highlighted by the retreat, as was its recognition that we are standing at a crossroads in this city's history. As representatives of the people, we have been entrusted to work the raw materials of Los Angeles's human and natural resources and turn it into the model for a 21st-century city. What's next? In the coming months, we will be setting up visits to each council district. We will have in-council broad-view policy discussions on the highest-profile issues that confront our city: public safety, the environment, and mobility, to get started. 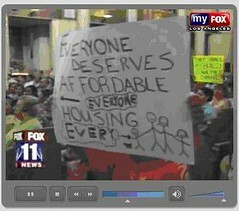 I think we will become an even more effective body at advocating for the residents of Los Angeles. The title of this post comes from Martin Cox's report to Jenny Burman over at Chicken Corner. Yes, the boats are back on the water, Saturdays and Sundays this summer from noon until 6 pm. Echo Park wouldn't be the same without them. As a councilmember, you have to make a few hard decisions. 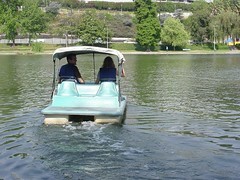 Keeping the boats on Echo Park Lake wasn’t one of them. Walk around the lake and see the kinds of investments we’ve made in it. We recently completed the first phase of a half-million-dollar renovation to the boathouse. Before that, we put the green floating islands you see out on the lake. They filter the water and attract herons and other waterfowl. L.A. voters passed a half-billion-dollar bond to clean up our water. One of the single biggest projects of the bond is going to overhaul Echo Park Lake. But our biggest investment in this park is people. People who come to the park to rest, or to run; to meet and talk or to sit and think. This is a safer park than it was ten years ago. It’s a cleaner park than it was ten years ago. And we don’t want the investments that people have made in this park to disappear. Part of our community here comes from having a place you can take a boat out on a lazy Sunday afternoon, enjoying the sun (or the shade over the boat) and dodging the spray of the fountain. Our goal is to improve the operation. Long-term, as the Prop O improvements transform the lake, we’d like to see even more uses at the boathouse, not fewer. In the short term, let's get all boats rented all day. Los Angeles has made dramatic progress on recycling: we now divert 60% of our trash stream into recycling, the highest city in the nation. What's more, we're aiming for 70%. The Daily News shows one way that we're doing it: with Bureau of Sanitation ambassadors who tour your trash bin with you and show you what you've thrown away that you could recycle. Another route to increased diversion: moving citywide with our multi-family recycling project. Live in an apartment building that doesn't have city recycling yet? You can show your building manager how to get it with the details on this page. Under Rule 1 of the Los Angeles City Council, every two years, the city clerk takes the president's chair to open the first council meeting of the new fiscal year. By a voice vote, the councilmembers select the council president, whereupon the elected councilmember commences the two-year council session. This morning, I received the votes of my colleagues, and I thank them for electing me to continue holding the Council Presidency. I took this job on with the hope of helping each member of the council address the big issues confronting our city that he or she has taken on. In the spirit of continuing to work on those issues in ever closer cooperation, I begin the 99th session of the Los Angeles City Council. I am pleased to continue working with Councilmember Wendy Greuel as President pro tempore and with Councilmember Jan Perry as Assistant President pro tempore. Below the fold, the remarks I gave upon accepting the Council Presidency. Thank you, City Clerk Martinez. And thank you to my colleagues for this honor of serving as your council president. I accept this position with purpose. Our purpose is reflected in the very firmament of this building, where in 1928, our predecessors laid a cornerstone filled with sand from every county and water from every mission in this state. Our families come here from different places. Our professional backgrounds are wide-ranging and diverse. And we represent very different parts of Los Angeles. But we serve one city. Just as we take an oath to serve our city and its people, I promise to do everything in my power to serve you for the next two years. Each of us around this horseshoe is blessed—we serve in the most open, robust, and vibrant legislative body anywhere in this country. In a nation where people feel increasingly isolated from their government and from their elected officials, our course runs counter to that. People come to council chambers to share their joy, their anger, their tragedies, and their hopes with this body and, in turn, with this city. The challenges our city faces and the accomplishments it realizes can be an inspiration to the world. There is no city on this earth exactly like ours—mosaic neighborhoods that are home to the city’s newest residents, a strong and always-evolving economy, the creative capital of the world. Against this backdrop, our duty is to enable all the people of our city to achieve a good life—an affordable place to call home, a safe neighborhood with good schools, clean air and water, an opportunity to work hard and be able to support your family. We face serious issues that have real consequences. But this council has the power to confront and resolve these issues and to leave our mark on this great city for future generations. We are literally changing the course of a river. We are making communities safer and creating new opportunities for our city's youth. We are balancing this city’s budget, and protecting vital city services. We are building new busways and rail lines. We are cleaning our waterways and preserving more of our resources. We are expanding shelter beds and building more units of housing than we have seen in decades. And as councilmembers, we are responding to crisis, whether in the wake of a neighborhood shooting or a fire that ravages our city’s hills. We have shown we have the power and purpose to lead. But the council’s leadership does not reside in me, or even in the president pro tempore, the assistant president pro tempore and me. It resides in fifteen individuals around this horseshoe. What makes this body great is not any one of us; it is the collective wisdom, experience, and passion of us all. In fact, the next great idea for moving this city forward will come from the person in the chair right next to you. So in the next two years, let us not only lead but let us listen. Let us listen to each other. Let us listen to our constituents. And let us listen to this great city. Thank you for electing me to lead this body for the next two years. 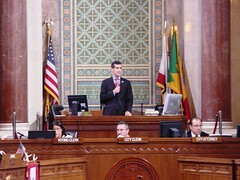 Today we begin the 99th session of the Los Angeles City Council. We are the inheritors of a proud tradition stretching back to this city's ayuntamiento, the original town council that first met in 1812. But we are also the inheritors of a great story—the growth and evolution of one of the greatest cities in human history. In this 99th session of our council, in our city’s 226th year, let us write a proud chapter in that history. Robert M. Wilkinson Multipurpose Center, 8956 Vanalden Ave. in Northridge, (818) 756-7741.